Will the 'Zeke Effect' plus a strong NFL draft class make it cool to be a running back again? One by one, they took the plunge. D'Onta Foreman, a Texas kid who quietly ran for 2,028 yards in one season, was one of the first to declare for the NFL draft. Dalvin Cook went a month later, on New Year's Eve, shortly after he ran all over Michigan in the Orange Bowl. "I'm going to be taking my talents to the 2017 draft," he said in a video live on Instagram. By January, 17 running backs, including one who finished 2016 tied for 174th in rushing, had decided to leave school early and enter the draft. They are a part of a class of running backs that is considered one of the strongest in recent memory, deep from top to bottom. History is not in their favor. Running backs, in a pass-happy NFL, have long been devalued. Only three have been drafted in the first round in the past four years. Before the 2016 season, the most recent team to take a giant leap and select a running back in the top five of the draft was Cleveland in 2012. Trent Richardson was explosive and powerful and dubbed a can't-miss pick, and he hasn't played a down since the 2014 season. Foreman pondered the fleeting nature of the running back, and he knows the grim statistics. On Sundays last fall, Foreman would turn on the TV, and there was his hope, wearing a helmet with a star. He watched rookie Ezekiel Elliott break tackles, block mountains and help lead the Dallas Cowboys to the playoffs. "It was big," Foreman said. "I was really proud of Elliott and the things he was able to accomplish. It helped the running backs a lot. For him to come in as a rookie and put up those type of numbers, that was big for everybody." Foreman wasn't the only one watching. Cook, LSU's Leonard Fournette, Stanford's Christian McCaffrey and Tennessee's Alvin Kamara were among the backs who mentioned during the NFL scouting combine that Elliott had helped their cause. "It helped us completely," Fournette said. "It showed he was not just a running back. He can help in the passing game. He can run. He can block. I think he led a great way for these running backs coming out now." Call it the Zeke Effect. Dallas, coming off a 4-12 season, picked Elliott No. 4 overall in the 2016 draft. The rookie ran for 1,631 yards and 15 touchdowns, and the Cowboys went from the cellar to the best record in the NFC. It helps, of course, that Elliott ran behind the best offensive line in the NFL. But running back is the most instant-gratification position in the draft, and the Cowboys saw the yield of their risk immediately. Because teams in the NFL are occasionally known to copy one another, it is almost certain that at least one, hoping to replicate the Cowboys' magic in 2016, will abandon convention and pick a running back very early on the first night of the draft, April 27 in Philadelphia. Teams will have plenty of choices. 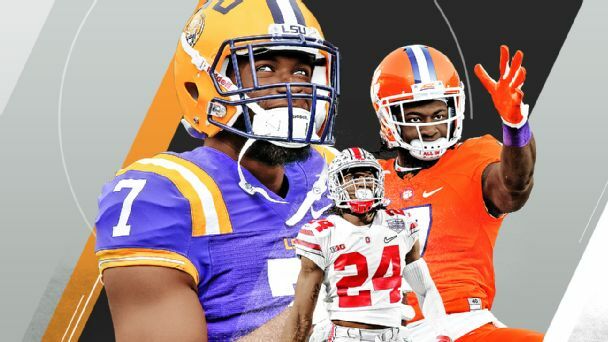 Fournette and McCaffrey are projected top-10 picks, Cook is also expected to go in the first round, and there could be more. The class has NFL size, speed and versatility. But has Elliott given everyone a false sense of hope? Or will 2017 mark the return of the running back? "As men, we've got a lot of pride," said one NFL decision-maker, who spoke on the condition of anonymity. "We love to poke our chests out when we're right. So for them to come out and say [they'll draft a running back high] because of the Zeke factor, for anybody in the league to come out and say that, they probably won't. They'll lean more toward the deeper class." Here's why teams don't spend high draft picks on running backs: They're often treated like car parts. Teams use them for a few years, they break down, and then teams replace them. The position has the shortest life span in the NFL, lasting on average less than three years, according to NFLPA research. Sixty percent of the running backs drafted in the first round from 2009 to 2014 are no longer in the NFL. Elliott was the only back taken in the first round last year, and he led the NFL in rushing. The second-best rusher in 2016 was also a rookie, and he didn't cost nearly as much money. The Chicago Bears took Jordan Howard on the last day of the draft, in the fifth round, and he ran for 1,313 yards and six touchdowns on 252 carries. Sometimes, there's plenty of talent later in the draft. Two of the stars of Super Bowl LI -- New England's James White and Atlanta's Devonta Freeman -- went in the fourth round in 2014. The Richardson pick in '12 no doubt scared off many teams because for the next two seasons, no running back was picked in the first round. (Todd Gurley and Melvin Gordon were taken in the top 15 in 2015). Joe Banner was hired in Cleveland shortly after the Richardson debacle, and in one of his first big moves, he traded Richardson to Indianapolis for a first-round pick. He didn't have anything against Richardson. Banner just doesn't believe that teams should waste a high draft selection on a running back. He was a longtime exec for the Philadelphia Eagles, a franchise that always seemed to find stars in later rounds. Neither LeSean McCoy nor Duce Staley nor Brian Westbrook was a first-rounder, and Banner would put each of them up against anyone. "I don't agree with the theory that running backs became less important," said Banner, now an ESPN analyst. "I think what happened and what is still happening is that it's the only position in the game where there are more quality players than you actually need. There's too many of them. Every other position, there's a shortage of players. "Not that there aren't exceptions, but if you want to get a really good left tackle or a really good pass-rusher or corner, more of them come out of the first round than any other place. So the philosophy was if you can get a good running back in the second or third round, especially one that can also help in the passing game, then why would you use a first-round pick?" Banner isn't sure why there are so many running backs. He figures some of it might have to do with the fact that it's the one position, besides maybe kicker, in which size isn't necessarily a factor. Perhaps that's why free-agent running backs don't command the money of other positions. A collection of the most prolific running backs of this decade -- Adrian Peterson, Jamaal Charles and LeGarrette Blount -- went up for free agency this winter. They have yet to be signed. When Foreman was in high school in Texas City, Texas, his father implored him to switch positions to linebacker. He worried about longevity and the fact that running backs weren't being drafted as high. But Foreman didn't care. "My passion wasn't to play that," Foreman said. "We had a lot of back and forth with that. I just stuck to my guns. "That adrenaline rush ... there's just something about it. You've got people chasing you. You're being physical. It's just a different feeling than the other positions I've played." Here's why teams have to pick a good running back as soon as they can in the draft: They'll never get them at a better time. Stephen Jones, the executive vice president, CEO and director of player personnel for the Dallas Cowboys, acknowledges that initially, the running-back stigma is something the front office thought about. That was put to rest when the Cowboys conducted a study that revealed that teams get the most out of running backs in their first four or five seasons. "We kind of came to the other side of the coin," Jones said, "which is, let's go and draft one high and get his best years out on the front end. After we did some research, it had us really feeling comfortable about taking a running back." A running back, in some extreme situations, can save a coach's job. Nobody in Dallas will say that's what Elliott did, but consider the landscape in early 2016. If you clicked on any "Coaches on the Hot Seat" link then, Jason Garrett was featured prominently on the list. Months later, he was the NFL's Coach of the Year. Elliott was a rare 6-foot, 225-pound talent who could do everything: run, catch and pass-protect. Garrett played with Emmitt Smith two decades ago and yearned for the days when a two-dimensional offense helped the Cowboys win three Super Bowls in the 1990s. Garrett got his first good glimpse of Elliott in the owner's box at AT&T Stadium during the 2015 College Football Playoff National Championship, in which Elliott ran for 246 yards and four touchdowns. The red-haired coach was intrigued. He hoped Elliott would help keep the defense off the field and take pressure off his oft-injured veteran quarterback, Tony Romo. Nobody knew what would happen next: that Romo would get hurt again, that rookie quarterback Dak Prescott wouldn't just be a natural fill-in, that he'd be so good he would replace Romo permanently. That's the thing about the NFL draft. In a year, it can turn a coach and a front office into geniuses. The Cowboys were able to exploit a league that for years has become so geared toward stopping the pass that defenses have gone smaller, with more emphasis on the secondary. Elliott just ran over them. "He blew it up. He killed it," Tennessee running back Kamara said of Elliott. "That contributed a little bit to the hype around this running back class. "I think the position is back. People are aware of that. This draft is going to show a lot." Kamara is probably the best example of the depth in this class. He shared the load with Jalen Hurd at Tennessee, which meant his numbers -- 596 yards on 103 carries -- were unspectacular. Still, Kamara is listed as high as a first-round pick in some mock drafts because of his explosiveness, his receiving skills and his impressive combine numbers in the vertical and broad jumps. Fournette is considered the jewel of the class, a punishing 240-pounder, a rare blend of power, size and speed. McCaffrey has been the subject of a lot of pre-draft buzz too. If Kamara is picked Thursday night, it would be the first time since 2008 that four running backs came off the board in the first round. If teams decide to wait, they could get a first-round talent in Joe Mixon. The Oklahoma running back is considered one of the best talents in the draft, but he punched a woman in the face in 2014, and his name became even more toxic when a video of the assault was released earlier this year. At least one NFL decision-maker believes Mixon will be a great success and listed Mixon as the second-best running back in the draft, a 1(b) to Fournette's 1(a). He believes Mixon will have to go to a smaller-market team, like troubled receiver Tyreek Hill did last year. The Kansas City Chiefs picked Hill in the fifth round, and Hill went on to have a huge rookie season. "I've always been a proponent of taking a running back in the first round," says former Tampa Bay Bucs general manager Mark Dominik, now an ESPN analyst. "Because you can see how much of an impact they have. Everybody sits there and says, 'Hey, just take one in the third or fourth round,' and you can come up with names of guys who have done well. Yeah, but there are also 800 guys who've been drafted in the same spot who never panned out. "When you find one that you like, like they did with Ezekiel Elliott, like we're going to see about guys in this draft class, you go get them. It's OK."
The winter and spring months leading up to the NFL draft do nothing for a young man's ego. It's the season of negativity, as teams do everything to find flaws in a player, to break him, because nobody wants to inflate a player's value or tip their own hand. In early March, at least one coach was willing to be a little more positive. Cincinnati Bengals coach Marvin Lewis said his team loved Elliott in the days leading up to the draft last year. They had him rated as the best player. Lewis believes there is a running back in this draft who might be "close" to Elliott's talent. Obviously, he won't say who. Asked if a team might take another leap and pick a running back early, he said, "We might be that team." Of course, this could all be smoke and mirrors because that's what the months leading up to the draft are all about. Or maybe the league's attitude toward running backs is changing a little. Lewis said Dallas' pick last year "opened up eyes." "I think everybody wants to have a running game because it's generally an easier way to move the football," Lewis said. "I just think it's an evolution of ability. It's timing. It's a strong class. Maybe it will be cool again to be a running back." ESPN staff writer Todd Archer contributed to this report.